Khadi and Village Industries Commission, Ministry of MSME, Government of India has inked a partnership with Raymond Ltd, one of India's leading Textile and Apparel Company. The initiative explores synergies between two Indian brands that boast of 'Make in India' legacy and represents the cultural heritages of India. V.K. Saxena, KVIC Chairman, said, "Inking an agreement with Raymond for value added marketing of Khadi is an act of integrating rural industry with urban industry, which in other words is the socio-economic unity of nation's creative diversity. In line with the Prime Minister's vision, this agreement is going to bridge the urban-rural divide. This therefore is a humble gesture of KVIC in this direction." Gautam Hari Singhania, Chairman and MD, Raymond Ltd., said, "In our quest to remain committed towards 'Make in India' initiative and aligned with Honorable Prime Minister's vision for Khadi, this is a defining moment as this association with KVIC will create multiple employment opportunities and will empower the artisans, especially women in rural India." Usha Suresh, CEO KVIC said, "To promote khadi as a global and a fashionable fabric, this partnership with Raymond will provide khadi a niche among the fashion conscious global Indian who is also a genuine lover of hand spun fabric." Sanjay Behl said, "With this association, it is our endeavor to position Khadi by Raymond as a true Indian fashion fabric globally. 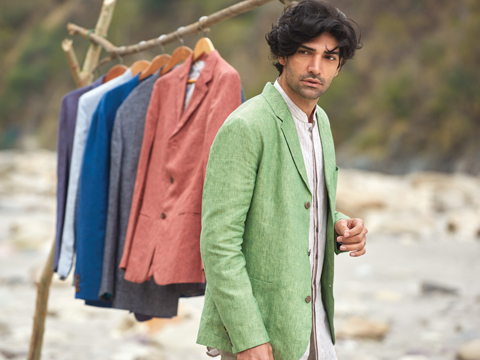 Raymond will offer a wide array of fabric blends and garments spanning across Khadi suits, jackets, shirts and trousers, in line with international design and quality trends."